London, England (CNN) -- An ash cloud from an Icelandic volcano was projected to snarl international travel for a third straight day, as flight cancellations and airspace restrictions stretched into Sunday. British Airways canceled flights to and from London airports on Sunday, and the United Kingdom's air traffic agency extended restrictions on U.K.-controlled airspace until at least 7 p.m. Sunday (2 p.m. ET). Thousands of flights were canceled Saturday. European air traffic officials said 5,000 flights took place instead of the customary number of 22,000. About 10,400 flights took place in Europe on Friday, compared with the normal 28,000. There were restrictions on civil flights in 23 countries across most of northern and central Europe. This swath includes Austria, Belgium, Croatia, the Czech Republic, Denmark, Estonia, Finland, most of France, most of Germany, Hungary, Ireland, northern Italy, the Netherlands, Norway, Poland, Romania, Serbia, Slovenia, Slovakia, Sweden, Switzerland, Ukraine and the United Kingdom. The eruption began March 20 beneath the Eyjafjallajokull glacier in southern Iceland, blowing a hole in the ice. It worsened this week, forcing local evacuations and eventually affecting European airspace. Although barely visible in the air, the ash -- made up of tiny particles of rock, glass and sand -- poses a serious threat to aircraft. The situation has upended lives for millions of travelers but for now, many are adjusting to the inconvenience. Kara Helwig of Neenah, Wisconsin, told CNN her 15-year-old daughter, Megan Emenecker, was stuck in Paris after her flight home from her French club trip was canceled. "She didn't sound worried. They're just definitely ready to get home. They probably don't even have any clean clothes and are low on money. But they're all in pretty good spirits," Helwig said. She said the group hopes to leave on Tuesday. Conversely, at least 150 French students were stranded in the New York metropolitan area, according to Marie Charrier, spokeswoman for the French consulate. The students have been given access to the consulate's phones to call home, she said. Two locations of Lycee Francais -- French-language schools -- are sheltering some of the students in their gymnasiums, Charrier said. Two hotels donated sheets, blankets and toiletry kits. The consulate is trying to help in getting the students home, she said, and in some cases has been helping with food costs. Steve Patterson of Midlothian, Virginia, and his wife were supposed to fly home Friday from the Hague, Netherlands, where they had been visiting relatives. Their flight was canceled and they've been rebooked on a Monday flight. Patterson told CNN the couple misses their four children -- all under the age of 9 -- at home, and have been speaking with them by phone and Skype. "We aren't worried about them because they are being cared for by multiple friends and family," he said, adding the couple is "mainly just sad that we aren't with them. We miss them and can't wait to be reunited." On Saturday, airlines such as American and Continental sliced intercontinental flights. About 600 trans-Atlantic flights take place each day, 300 in each direction. Of the 300 flights that would usually arrive in Europe, 73 flights arrived in Europe on Saturday morning. Other airlines such as Air France, Lufthansa, Ryanair and Qantas announced restrictions to their schedules in Europe because of the ash, which experts have said can stall engines and cause electrical failures on board aircraft. There were delays and cancellations Saturday at all 10 of Russia's international airports, including those in Moscow and St. Petersburg, the Russian Transport Ministry said. Upper air space has been made available in some of these restricted areas, depending on the observed and forecasted area of ash contamination, air traffic officials said. Parts of southern Europe, including Spain, the southern Balkan area, southern Italy, Bulgaria, Greece and Turkey remained open and flights were taking place in these areas, the officials said. The Icelandic volcano continued to erupt on Saturday, according to an official with Iceland's Department of Civil Protection and Emergency Management. He said it's not clear when the eruption will end. 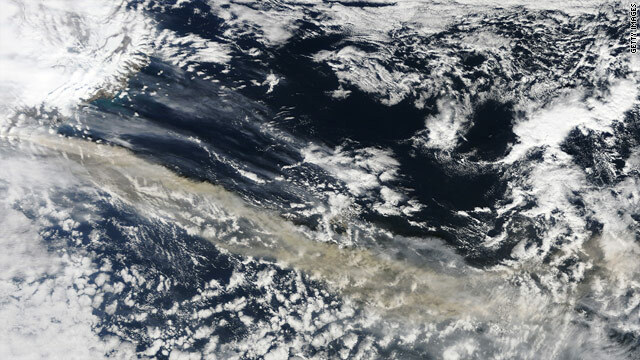 The United Kingdom's National Air Traffic Services said volcanic ash cloud from Iceland is moving around and changing shape, Weather forecasts show the ash cloud progressively covering the whole of the United Kingdom after 7 p.m. (2 p.m. ET) Saturday, the agency said. World leaders planning to reach Poland this weekend for the funeral of President Lech Kaczynski faced challenges because of the volcanic ash. French President Nicolas Sarkozy, German Chancellor Angela Merkel and U.S. President Barack Obama all canceled plans to travel to Poland Saturday for Kaczynski's funeral on Sunday. Foreign Secretary David Miliband and Prince Charles also said they were unable to attend. Airlines were rebooking passengers, and people were turning to other travel options, such as cars, trains and ferries. Alexey Bekin, a 40-year-old Muscovite who runs a construction company, has been stuck in Geneva, Switzerland -- his situation illustrating the frustrations of stranded air travelers. After his flight home to Moscow was canceled Saturday, he said Aeroflot offered people hotel rooms that would have to be shared with strangers. Bekin opted to pay for his own hotel room. He considered taking a train to Milan to catch a flight, but all the trains were sold out. He has been rebooked for a flight on Wednesday.